General Description of Cytokeratin 15. Keratins are a family of intermediate filament proteins that assemble into filaments through forming heterodimers of one type I keratin (keratins 9 to 23) and one type II keratin (keratins 1 to 8). Keratins demonstrate tissue and differentiation specific expression profiles. Keratin 15 is a type I keratin which is expressed only in basal keratinocytes in stratified epithelia and does not appear to have a natural type II expression partner. Keratin 15 is down regulated in activated keratinocytes. Cytokeratin 15 is a specific marker of stem cells of the hair-follicle bulge and may be a useful marker for diagnosis between basal cell carcinoma (BCC) and trichoepithelioma. Trichoblastoma are benign neoplasms of follicular differentiation frequently found in nevus sebaceous. Many morphologic features are shared with nodular basal cell carcinoma, sometimes rendering a diagnosis difficult. Trichoblastoma and BCC show variable expression of Cytokeratin 15 and Cytokeratin 19, and absence of hair keratins. 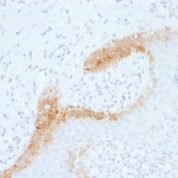 Anti-KRT15 antibody staining is expected to be primarily localized to the intermediate filaments. There is variability in either the signal strength or the localization of signal in intermediate filaments from cell to cell. 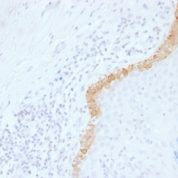 Variations in Cytokeratin 15 antibody staining intensity in immunohistochemistry on tissue sections are present across different anatomical locations. An intense signal was observed in glandular cells in the breast, respiratory epithelial cells in the bronchus and squamous epithelial cells in the esophagus. More moderate antibody staining intensity was present in glandular cells in the breast, respiratory epithelial cells in the bronchus and squamous epithelial cells in the esophagus. Low, but measureable presence of Cytokeratin 15 could be seen inglandular cells in the prostate. We were unable to detect Cytokeratin 15 in other tissues. Disease states, inflammation, and other physiological changes can have a substantial impact on antibody staining patterns. These measurements were all taken in tissues deemed normal or from patients without known disease. 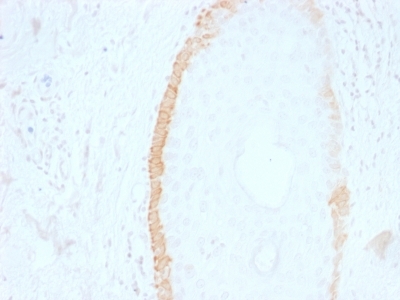 Tissues from cancer patients, for instance, have their own distinct pattern of Cytokeratin 15 expression as measured by anti-Cytokeratin 15 antibody immunohistochemical staining. The average level of expression by tumor is summarized in the table below. The variability row represents patient to patient variability in IHC staining. enQuire Bio's Cytokeratin 15 Anti-Human Monoclonal is available for Research Use Only. This antibody is guaranteed to work for a period of two years when properly stored.